I promise I am officially cut off of pumpkin baked goods from here on out (not true but I’ll try). 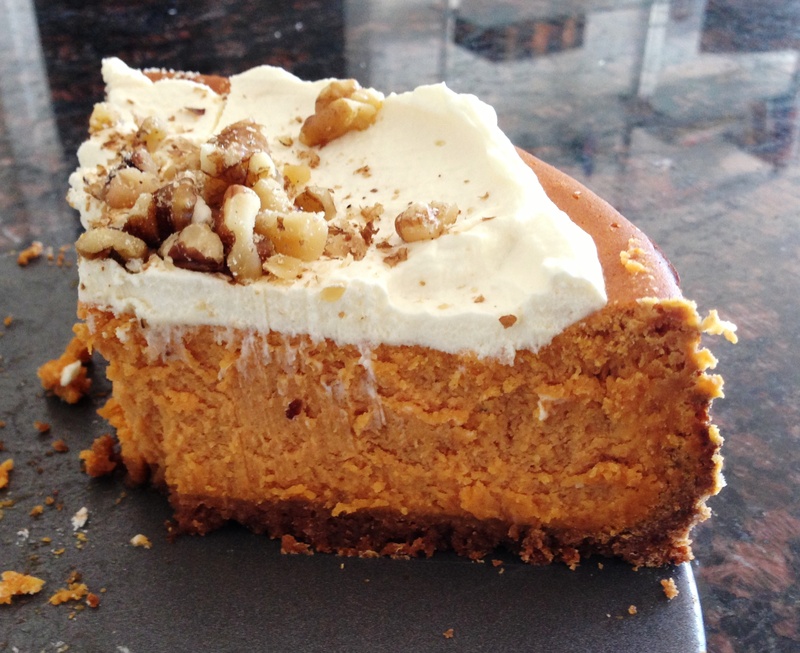 Between pumpkin bread, pumpkin granola, a couple apple crisps, apple muffins, apple sauce, even pumpkin…alfredo…. I should really remember it is possible to ingest non-fall flavored food during the month of October. 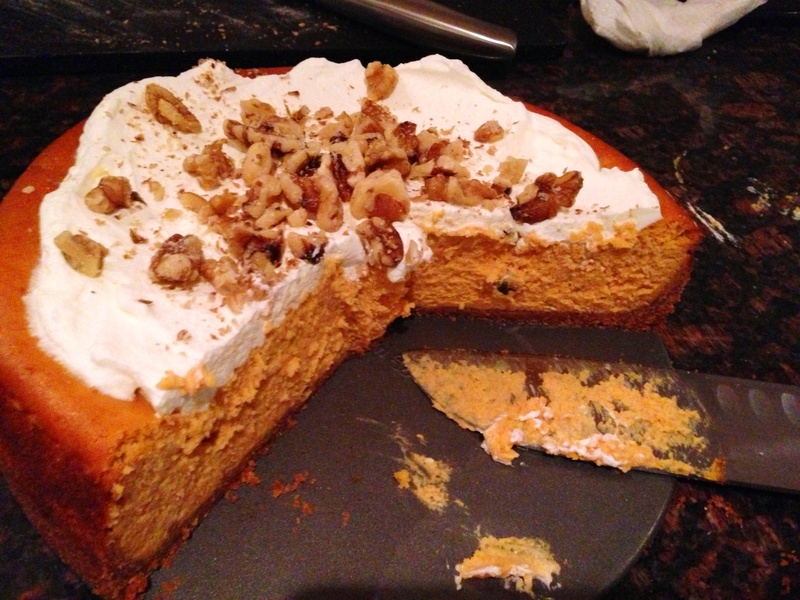 I contemplated not posting this cheesecake due to the large crack on the top and to avoid back to back pumpkin posts. 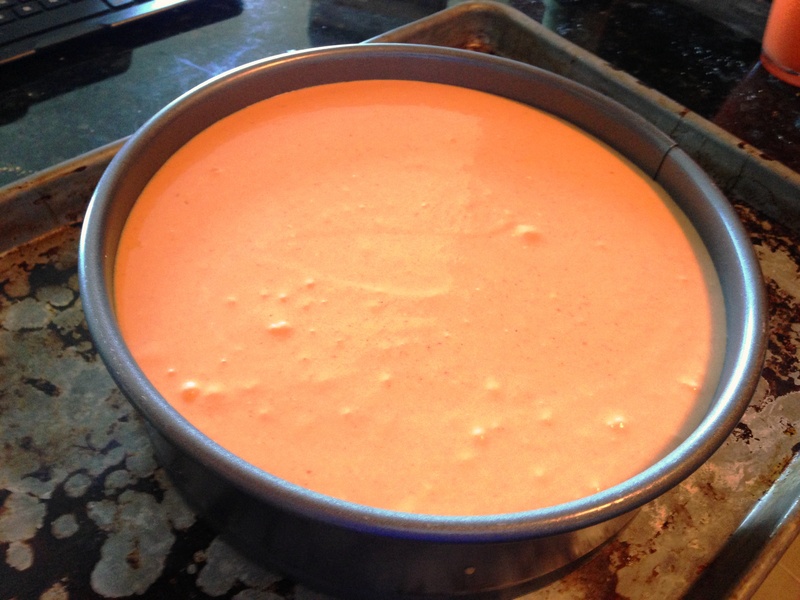 Fortunately, it tasted too good not to share… If you’re a little intimidated by cheesecake this is a perfect and easy recipe to get you going. 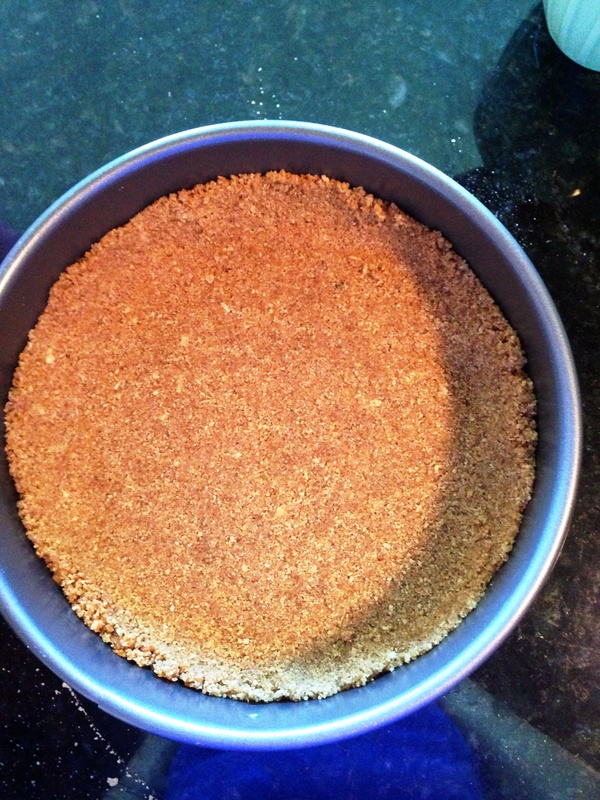 Combine crumbs, sugar and 0.5 teaspoons of cinnamon. Add melted butter. Press down into a 9-inch springform pan. Mine crept about a third of the way up the sides. Set aside. 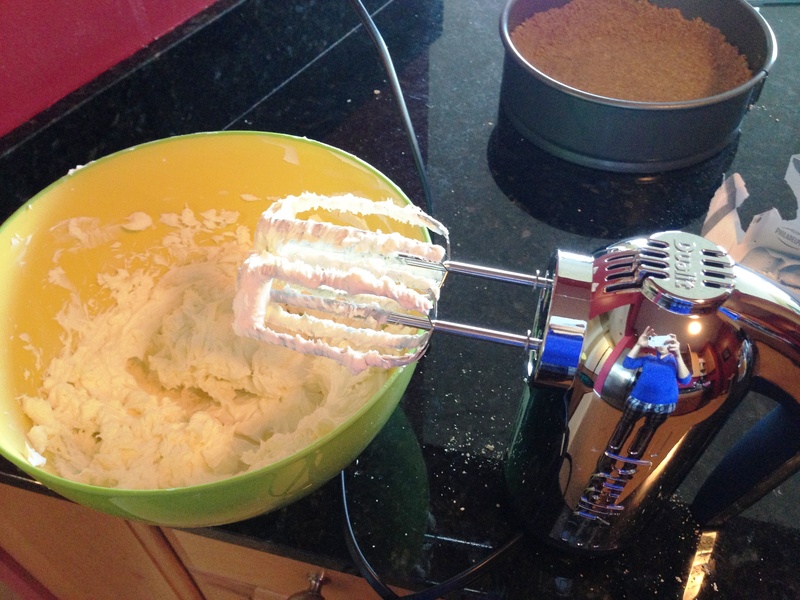 Beat cream cheese with a hand mixer until smooth. Beat in pumpkin puree, eggs, egg yolk, sour cream, sugar and remaining spices. Mix in flour and vanilla until well combined. Pour into crust and smooth out. Bake at 350 for an hour and twenty minutes. I probably over cooked this… it did in fact crack. 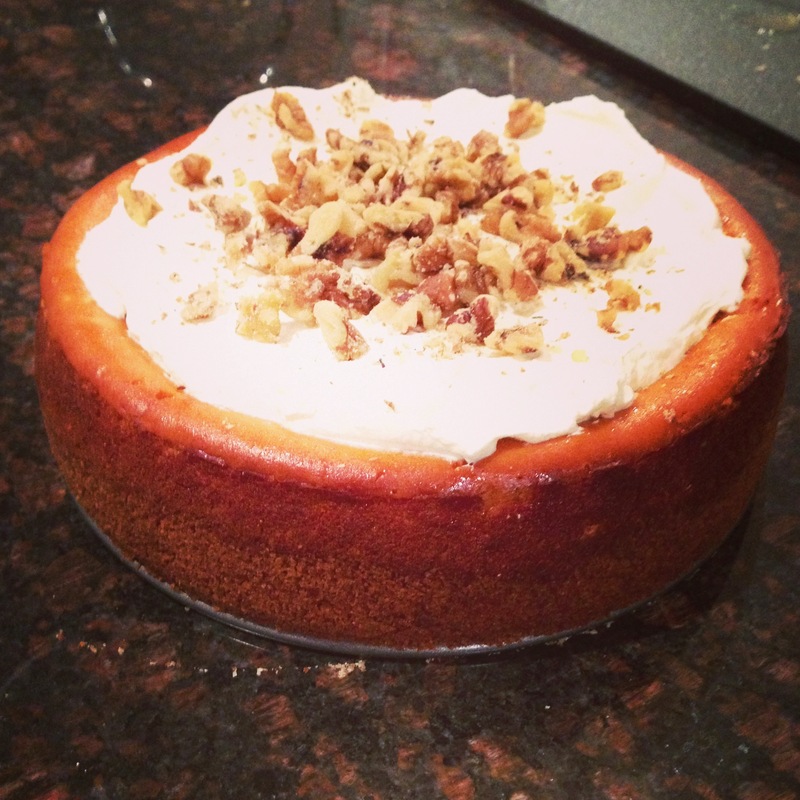 You want the cheesecake to jiggle somewhat but not more so in the center than in the rest of the cake. If it does this after an hour feel free to take it out. I was a little paranoid about it being undercooked so I gave it a full hour twenty (extra twenty minutes to have your apartment smell like Fall). Let cool in pan for 15 minutes. Remove from pan, wrap in plastic wrap and refrigerate for at least four hours. Smooth fresh whipped cream over the top and sprinkle with walnuts. I love pumpkin. Don’t think I’ve ever had it in a cheesecake tho.